The business orientation of COBIT consists of linking business goals to IT goals, providing metrics and maturity models to measure their achievement, and identifying the associated responsibilities of business and IT process owners. COBIT aims “to research, develop, publish and promote an authoritative, up-to-date, international set of generally accepted information technology control objectives for day-to-day use by business managers, IT professionals and assurance professionals”. With this course, you’ll receive 6 months access from the date of purchase as well as a FREE exam voucher to use whenever you are ready to sit the COBIT 5 Level 1 exam! COBIT is the globally accepted framework for managing and governing an organization’s IT. The standard consists of principles, models and best practices, and analytical tools. It aims to enhance the value that can be derived from an organizations’ information systems, whilst at the same time increasing trust in these systems. COBIT can benefit and support organizations of all sizes and type get the most of out of their IT by balancing the need to create value with the requirement for managing levels of risk and usage of resource. COBIT® is a registered trademark of ISACA and the IT Governance Institute. In this module you will also learn about the COBIT 5 family of products. This module provides a quick run through the issues around IT Governance and how it fits into the general Governance of an organization. This module provides a general overview of governance and the implications for business of implementing governance. It is important to remember that this module and the next module are not examinable modules, but they are an important background to introduce you to the concepts and discipline of governance and technology governance. Before starting on the COBIT 5 journey it is necessary to establish the context within which the framework is relevant and useful. To that end, we’ll provide a general understanding of what IT governance is and some of the challenges boards have faced, leading to a recognition of the complexity of the IT environment, with its many functions, structures, frameworks, roles etc., all of which give rise to a multitude of IT issues and risks. In order to manage these challenges 3 viewpoints are introduced – Organization, Executive Board and Management and thirdly IT management. This is further detailed from the perspective of ineffective IT governance. This module, Module 2, Principles, is the first module that begins to address the specific Learning Objectives that are mandated for the COBIT 5 Foundation exam. ISACA is quite explicit in specifying the basic knowledge of COBIT that it expects you to have acquired in order to pass the Foundation exam. We will look at the five principles that underpin COBIT 5 and the processes and methodologies that derive from them. Once you are confident that you have thoroughly grasped the implications of these Principles you will be ready to proceed to the next Module. First we will take a look at the Governance Objectives implied by Stakeholder needs and then understand how these arise by looking at the various drivers involved. From these considerations we will get an understanding how to translate the needs of the stakeholder into meaningful action. We will look at the COBIT 5 goals cascade, which is the mechanism to translate stakeholder needs into specific, actionable and customized enterprise goals, IT-related goals, and enabler goals. As with all of this course, your understanding of the current module builds upon the previous modules. You should be sure you understand well what you have learned so far before embarking on this module. In Module 3 we looked at Principle 1: Meeting Stakeholder Needs. In this module we will look more deeply into the Second of COBIT’s 5 Principles: Covering the Enterprise End-to-End. The Learning Objectives for this module include identifying the components of a governance system and the interactions between them. You will need to be confident in your understanding of these aspects before you move on the succeeding modules. In this module we will show how COBIT 5 achieves its role of a single and integrated framework. This is necessary because COBIT comprises a large body of knowledge from previous versions through to the current version but also other disciplines, standards and frameworks covering security, risk and assurance to mention just a few. COBIT 5 is a dynamic framework with continued efforts by ISACA to continually update and extend it and also make it relevant across multiple disciplines within the enterprise IT space. This module describes the COBIT 5 architecture and how it achieves the integration and alignment within a single framework by bringing together existing and new ISACA material with new guidance and other standards and frameworks. The COBIT 5 family of products is introduced. This Module discusses the Fourth Principle of COBIT 5 – Enabling a Holistic Approach. Remembering that the Learning Objectives are the specific things that will be examined in the Foundation Exam, there’s quite a lot of content here. This Module covers a critical differentiator between COBIT and most of the other frameworks that have a Governance aspect. What is striking about COBIT is the degree of separation and clarity of thinking predicated by the degree of separation between the aspects of Governance and Management. This is Principle No. 5 of COBIT, and in many ways the key to the whole edifice. The Learning objectives of Principle 5 are concerned about this separation – and also the pragmatics of the way they have to co-exist and interact – how they feed off each other might be another way of describing the relationship. We will consider these aspects separately as a matter of academic clarity, content in the understanding that in the real world it can be a considerable intellectual challenge to suitably separate them. We are progressing well and are getting to the main area of COBIT 5. Much of what we have covered in previous modules is a necessary foundation for the enablers that we will describe in detail here. This is a long module, but is important because it ties together what we have addressed so far. Enablers are factors that, individually and collectively, influence whether something will work. The COBIT 5 framework describes seven categories of enablers and each one will be covered in turn in this module. This Module discusses the COBIT 5 Process Capability Model which, is part of COBIT5 foundation – and as such is a subset of ISACA’s Process Assessment Programme, which augments this aspect of the COBIT5 Framework Guidance. We will look into the Process Assessment Programme to the extent needed to support the Foundation level thinking around Assessment. At the end of the module you should have a good understanding of the Process Capability Model and the basic ISO 15504 concepts, and the facts, terms and concepts that relate to the Process Capability Model. 4) Leveraging COBIT to identify gaps and guide the development of enablers such as policies, processes, principles, organizational structures, and roles and responsibilities. This is a multiple choice exam consisting of 50 questions. 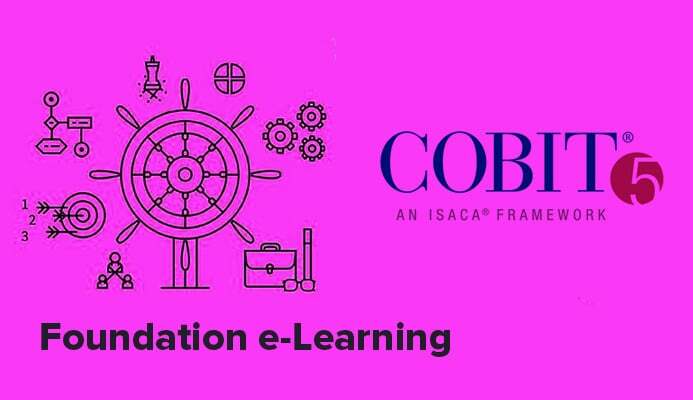 When you have completed the COBIT Foundation e-learning course, you should be ready to start preparing for the Foundation Level exam. This exam is available to take online, via a web-based examination system provided by APMG.